Colima region of West Mexico; Comala Style. Provenance: 1) A Private Houston Texas Collection formed during the early 1960s. 2) The Tim Misenhimer Collection, Bel Air, California, 2004. This dwarf exudes personality! 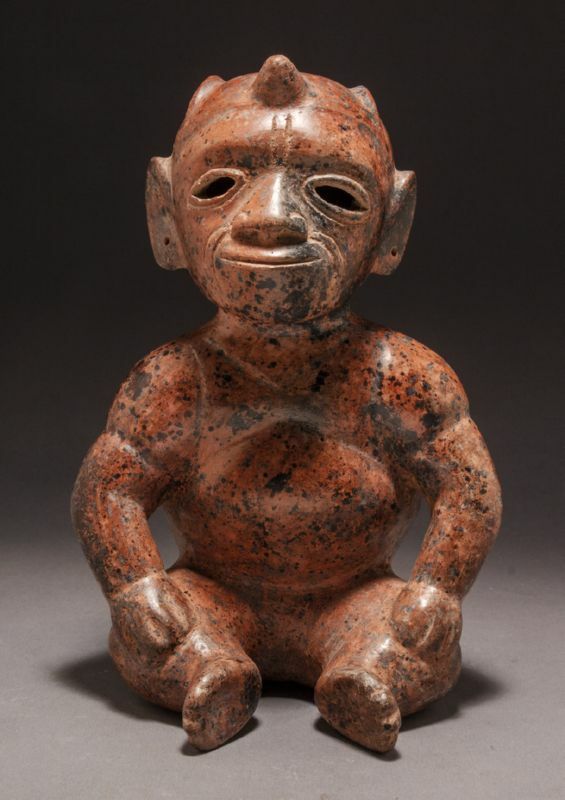 His eyes, pierced into hollowness, transmit an assertive gaze, perhaps shamanic, as he wears the "Horn of Power", symbolic of the shamanistic tradition in ancient Colima. He smiles with an enigmatically confident serenity. The incised lines about the eyes and mouth seem to indicate a mature human being. He is exceptionally indicative of an example of the most highly refined Comala sculptural tradition.